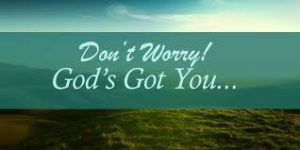 God's got you but do you have Him? We know that God is always there. God’s got you but do you have Him? We know that God is always there for us anytime we need Him. But the question is, do have Him as the head of your life? This makes all the difference. When we have a relationship with God, we surrender all things to Him and we trust Him with our lives in every area. We know that He guides us in everything and we accept His leadership. There’s nothing better than having a true relationship with God where we talk with Him daily and not just during a crises. So rest in knowing that God’s got you but make sure that you’ve got Him. Take care, stay encouraged and God bless you my encouragers. Please Check out my #StayEncouraged Podcast God is with you through everything.